That is the serious problem being faced by Western Europe and Russia. Japan and Korea, whose pensions and care for the elderly are among the world best, are suffering because they have overwhelmingly succeeded in the population-control programs. They now suffer from what experts call “the empty cradle” phenomenon. Japan and Korea may have policies and laws to provide generously for retired workers and the elderly but they are facing the problem of where to get the money for the pensions and the benefits from. The pension funds, like those of our SSS and the GSIS, need contributions from young workers and employees so that the pensions for the retirees can be paid. But if there are no more millions of young Japanese and Koreans entering the labor force and enrolling in the pension funds how can the pensioners be paid? Japan is increasingly depending on robots to do the work that used to be done by salaried workers. Robots are getting to be more efficient and competent—sometimes even more so than humans. Robots however do not contribute to the pension fund. That is why the population control desired by proponents of the so-called Reproductive Health Bill must be recognized as a threat to Philippine development, to the economy and to the common good. Last April, a World Health Organization official, warned that the Philippines must be ready for older people constituting larger and larger parts of the population. More money would be needed to care for the aged in our country. The heart-breaking movie Soylent Green 30 years ago offered a solution. Governments would just give seniors who reach the appropriate age a quiet and happy death. Then, because food would be scarce, their bodies would be processed into edible soylent green. For a better future than that we must reject the mistake that the Western Powers imposed on mankind—population control through contraception and abortion. Instead, the new world order should favor population replenishment and the florescence of the Culture of Love. World Health Organization sees the population of people 65 and older outnumbering children younger than five in our Western Pacific Region by 2017. By 2050, says WHO, 65 and older adults will outnumber children under 14. “The older age group is becoming the ‘new normal’ for the world’s population. Populations are ageing fastest in low and middle-income countries. A transition toward an older society took more than a century in Europe and might take place in less than 25 years in countries like Brazil, China and Thailand,” WHO said. Contrary to the population control lobbyists’ words, our birth rate has been declining steadily. It is now approaching the replacement fertility rate minimum of more than two births essential to avoid the ageing population disaster the West, Japan, Korea and even China have. PROPONENTS of the so-called Reproductive Health Bill are now marshalling their forces to call for a vote on it in both houses of Congress. Their zeal had noticeably been petering out in the weeks before the President delivered his SONA on Monday. But they got a morale boost when they thought they heard him endorse the RHB. The bill is not as much about reproductive health as about empowering women and giving them the choice to terminate their pregnancy so that they may more freely concentrate on doing what they want without the burdens of the “sickness” they call pregnancy and the sacrificial work of caring for unwanted babies and raising unwanted children. The RHB is also about being able to end unwanted pregnancies that are the result of their drunken husbands lust. It is also about so many wonderful goals to help women become more fulfilled human beings. But the bill will result in the killing of human embryos, the killing funded by government and made possible by government fiat, as ordered by the RH law (if, God forbid, the RHB gets passed and enacted.) This will surely happen because the law would command that medicines in pill and other forms, and various means and tools, to prevent pregnancies be made freely available for anyone who has the money to buy them and for the government to give these gratis to indigent women. The reason human embryos will surely be killed is that these contraceptive pills have been scientifically proved to be destructive of them. They do not prevent pregnancies by preventing the fertilization of the female egg by the male sperm. What they do is snuff the life of the fertilized ovum, which is the beginning of a human being, the early embryo, the first stages of the baby, by poisoning it. Then, in case the embryo is not terminated by poisoning, the contraceptive medicines’ next effect is to coat the uterine wall with a toxic substance to keep the embryo from clinging to the wall of the mother’s uterus. The tiny baby, which some people would rather think about as just cells and a blob of blood, and not the human life that it is, must attach herself or himself to the uterine wall to go on living. This attachment is the way the tiny baby can get sustenance from the mother and grow an umbilical cord through which the mother’s blood containing life-giving substances flows to make the baby grow. Opponents of the RHB have asked the proponents to make a list of contraceptive medicines that do not kill the fertilized embryo. They cannot supply a list. They say it is not the job of the law and the government to determine that scientific fact. It should be left to the pharmaceutical companies and the pharmacists dispensing the medicines to determine which contraceptives do what. That reply is irresponsible. Why pass a law that will cause the death of babies? Now killing babies, even in embryo form, is a crime. It is a crime NOT because the Catholic Church and other religions say so. 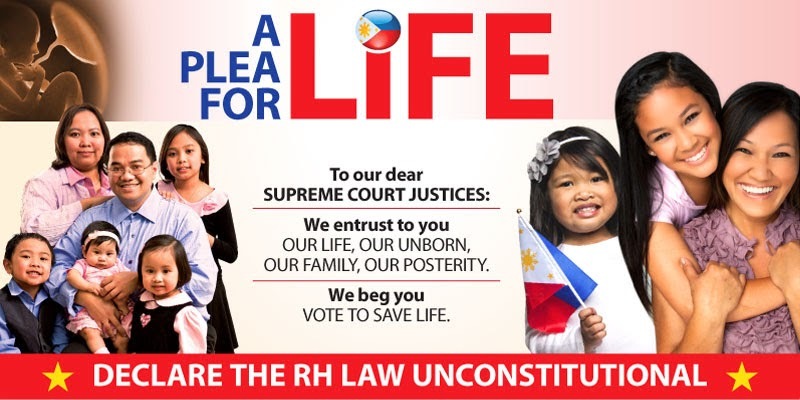 It is a crime because the Philippine Constitution says human life begins at the moment of conception and it is the duty of the Philippine state to protect and nourish human beings from the time of their conception to the time of their natural death. Therefore, the Philippine government would be committing genocide against Filipinos if the RHB is enacted. Doctors who prescribe contraceptive pills that kill and the pharmacists who sell them, the government nurse and public health officer and caregiver who are ordered by the law to distribute the abortion-causing contraceptive pills, will become murderers of little babies in the womb. Most members of Congress in both houses understand this. That is why the RHB has not been passed despite years of campaigning by Filipino population control and pro-choice activists supported by the foreigners who bankroll them. Obviously, the President is asking Filipinos to do birth control and family planning. But he never said anything about genocidal artificial family planning methods proposed in the RHB. How can he endorse artificial birth control pills that not only cause abortions but also cause cancers on the women who use them? RHB proponents have declared that they are not fighting the Catholic Church. They are saying that because a Catholic bishop has understood President Aquino’s mention of “Responsible Parenthood” in his SONA as the President’s and the RHB proponents’ “declaration of war” against the Church. The RHB activists may not be waging war against the Church—only its values and moral teachings. But they are fighting common sense, scientific knowledge of what these abortifacient medicines do and the Constitution. 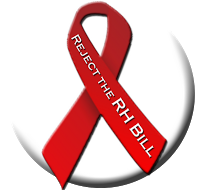 Erwin Tulfo: why the rush to pass the RH bill? Bernardo Villegas: Vote No to RH Bill! Catholics do have brains, Ms. Evangelista. 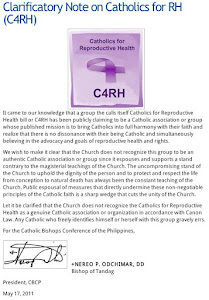 The de-facto legalization of the RH bill? How's this for real change and development?